Airport Express provides daily shuttle rides from Sonoma County Airport to San Francisco and Oakland Airport. 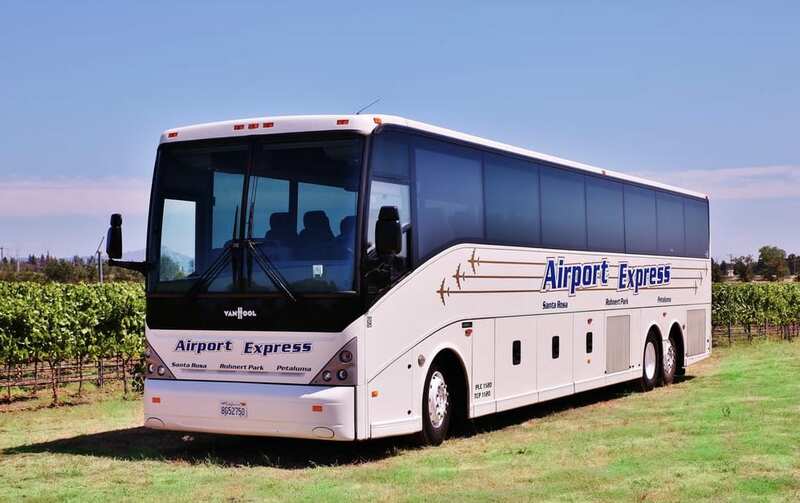 The station for Airport Express shuttle buses are located throughout the Sonoma County at 2255 Airport Boulevard, Santa Rosa, CA 95403/ Santa Rosa Airport; at 1350 Maple Avenue, Santa Rosa CA 95404; at 1 DoubleTree, Rohnert Park, CA 94928; at 175 Fairgrounds Dr, Petaluma, CA 94952; 3rd St and Hetherton St, San Rafael, CA 94901; Oakland Airport; and at San Francisco Airport. The Parking is available at the following locations: Sonoma County Airport for $11 per day, Doubletree Hotel for $8 per day, and Petaluma for a $5per day and $25 per week. The ride from the Sonoma County to the Santa Rosa airport and vice versa will take 2 hours depending on the particular location and distance to the airport. When paying for the ticket after the trip onboard the bus, the one shall keep in mind that no debit or credit cards will be taken, only cash and personal checks. For the convenience, the tickets might be purchased in ticket desks or online with a Visa or MasterCard. The Pick-up and Drop-off of the passengers are done directly outside baggage claim carousels. All Airport Express buses have reclining seats, air conditioning, restrooms, and overhead reading lights. The luggage limit allows the passengers to bring only two suitcases and one carry-on bag. For each additional bag or briefcase, the $6 charge is implemented. The buses have access for disabled passengers. Therefore, the majority of them have wheelchair lifts; however, the lift buses service might be purchased in advance. Pets are allowed onboard of the Airport Express buses; however, all dogs might be in a kennel and ride in the animal and cargo bay. The $6 charge shall be paid for each animal carried except service animals. Surfboards, bicycles, golf clubs under 7 feet are allowed on board of the bus as well; however, a $6 charge will be applied. Fares to and from Sonoma County one-way ticket is $36 for adults, $34 for seniors over 62, military workers, students between 13-21, free of charge for children under 12. The Airport Express buses depart from Sonoma County Airport to San Francisco Airport every 1 hour from 02:45 until 21:45. Buses from Park & Ride Santa Rosa depart every 1 hour from 03:00 until 22:00. Buses from Doubletree Hotel Rohnert Park depart every 1 hour from 03:15 until 22:15. Buses from Petaluma Fairgrounds Terminal depart every 1 hour from 03:30 until 22:30. Buses depart from San Francisco Airport to Santa Rosa Airport every 1 hour from 05:30 until 00:30. Those buses arrive at San Francisco Airport every 1 hour from 05:00 until 00:00. The Airport Express buses depart from San Francisco Airport to Sonoma County Airport every 1 hour from 05:30 until 00:30. Those buses arrive at Petaluma Fairgrounds Terminal every 1 hour from 07:00 until 02:00. Buses arrive at Doubletree Hotel Rohnert Park every 1 hour from 07:15 until 02:15. Buses arrive at Park & Ride Santa Rosa every 1 hour from 07:30 until 02:30. Buses arrive at Sonoma County Airport every 1 hour from 07:45 until 02:45. The Airport Express buses depart from Sonoma and Marin Countries to Oakland Airport and Sonoma Airport every 1 hour from 02:45 until 18:45. Buses from Park & Ride Santa Rosa depart every 1 hour from 03:00 until 19:00. Buses from Doubletree Hotel Rohnert Park depart every 1 hour from 03:15 until 19:15. Buses from Petaluma Fairgrounds Terminal depart every 1 hour from 03:30 until 19:30. Buses depart from San Rafael Third and Heatherton every 1 hour from 04:15 until 20:15. Those buses arrive at Oakland Airport every 1 hour from 05:00 until 21:15 and depart every 1 hour from 05:30 until 21:30. The Airport Express buses depart from Oakland Airport to Sonoma and Marin Countries every 1 hour from 05:30 until 21:30. Those buses arrive at San Rafael Third and Heatherton every 1 hour from 05:30 until 22:15. Buses arrive at Petaluma Fairgrounds Terminal every 1 hour from 07:00 until 23:00. Buses arrive at Doubletree Hotel Rohnert Park every 1 hour from 07:15 until 23:15. Buses arrive at Park & Ride Santa Rosa every 1 hour from 07:30 until 23:30. Buses arrive at Sonoma County Airport every 1 hour from 07:45 until 23:45.